I was going to write a recipe roundup for My Well Seasoned Life’s last post of 2016. But as I began to write down recipes and events what stood out most and had the greatest impact on me was caretaking my mom this year. Through the act of tending to her needs I found that a very caring and affectionate person hides underneath my cloak of snark and impatience. In August and October I was the sole caretaker of my mom. 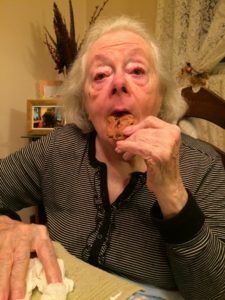 My mom’s Parkinson’s has rendered her so very vulnerable…childlike. 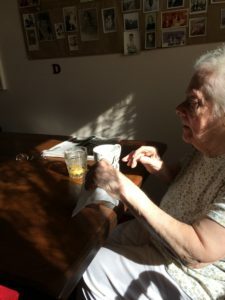 Her disease has stripped away any pretense of independence, she’s constantly in need of assistance: From the moment she awakens until she’s tucked into bed at night. After a week mommy and I fell into a routine: 5 am emergency pee trek, back to bed until 9, breakfast, Rachel and the View, lunch, rummy, wheelchair cruise, nap, dinner, PBS and bed. Repeat. Her world has slowly diminished. There are no more Elder Hostel trips, no rosary meetings, no decorating the altar for holy days, no more fun and laughter with the bridge ladies. The world she traverses now is the house she’s lived in for some sixty odd years. The highlight of her week is when Madeline arrives on Monday to administer communion. They pray together—the Our Father, Hail Mary, my mom stubbles on the Act of Contrition, mumbling the words, hoping no one will notice. 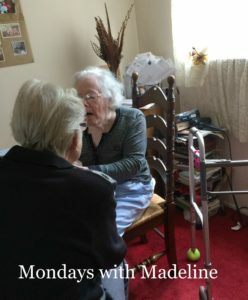 Madeline and my mom, both Eucharistic ministers, used to travel to hospitals and nursing homes together. Now, Madeline aged 90 is driven by her 93-year-old husband to give communion to people like my mom. Madeline is only three years older than my mom. Their lives so very different. My mom’s deaf…at times conveniently deaf. I have to speak loudly around her. Okay I shout. I believe it’s good to engage her in conversation. I keep our chats firmly planted in the present or else she drifts to the past. A past in which my dad is alive, her mom still vibrant and fashionable. Where she is the most beloved preschool teacher that ever lived. A past in which she fought depression, feared her alcoholic husband, fretted over her sons. A past where she knew I could always take care of myself…and I did…the best I could. Rachel Ray’s mother’s name is Elsa Providenza Scuderi. My mom’s grandmother’s name was Providenza Scudieri. Rachel Ray worked in a food market. My mom’s great aunt had a butcher shop where her grandmother worked. Put this information in a bowl, add a pinch of family and stir. Voila! Rachel Ray becomes my mom’s cousin. Oh, and she’ll show me the shop on our way through Paterson. On another voyage through her neuropathways. My mom asks if my father is dead. “Yes, he is.” She doesn’t believe me. Tired of her daily question, I tell her we are going to the cemetery to show her his tombstone, to which she nonchalantly states, “I know the way, I’ll show you how to get there Jude.” How can she not believe my dad’s dead AND know the way to his grave site? Ah, her mind works in mysterious ways. Mornings are my most dreaded time of day. I sit on my mother’s bed, stroke her arm as not to frighten her and gently call out ‘mom’. Then…I…wait. What version of my mom will awaken this morning? Will she awaken with darting eyes, eyes that betray her confusion, fear? Will she ask “What time is it?” in hopes of buying time to figure out where she is? Who I am? What she’s supposed to do? Her slow response, “Oh, Judy?” always takes me aback. Did she forget me? Or will she awaken with a smile? And respond to my ‘morning glory’ with ‘see the rain dear’ an exchange that eases my worry. One morning she awoke with the biggest smile. “Jude, I had the best dream. Robert was walking Michelle’s baby in a carriage. He could walk no problem. I’ve never seen him this happy.” (My brother Robert has MS and his daughter is expecting in April) After breakfast she calls Robert and tells him her dream. I can hear my brother smile. I put my mom to bed, cradling her body, guiding her head to the pillow as if she were my baby. I bring her blanket up around her chin and sit on the bed. “Another wonderful day in the adventures of Doris and Jude!” She smiles, “We had a good day Jude”. I bend over and kiss her, “Love you.” “Love you more.” I know she does. 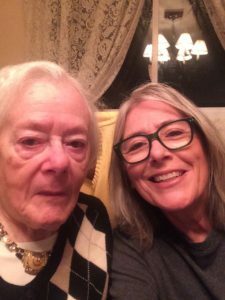 Simply beautiful, thank you Judy for sharing this journey with your mother. It reminds me that I am at choice to wake and live with a smile or a snarl everyday. Now that decision seems so obvious as it profoundly impacts me and everyone in my life. Thank you for that gift and happy new year to you both. Thank you Lisa. Happy New Year! Valentina I feel so very fortunate to have spent time with my mom. Thanks so much for your kind words. Happy New Year! That beautiful story made me cry, tears of joy and tears of sadness. I am happy for the both of you that you can still spend time together and find the beauty in the midst of chaos. You are a beautiful and amazing person. Cathy you care for your mom every day. Thanks so much for your very kind words. Happy New Year. So very happy you enjoyed the read Marth. You take care of mommy on a daily basis. Love you. This was so wonderful to read. You have been so good to your Mom. You have that special bond with her that will stay forever. It is amazing how she took care of her family when they were young, and now the tables turn. You nurturing your Mom is what she taught you as you grew up, despite all the things she has gone through in life. Your Mom is an amazing woman. And she is lucky to have you all to help out. You are amazing also. Just beautiful. So touching, Judy. Thanks for sharing. Happy New Year. You are beautiful, Judy. Your mom and you are lucky to have each other. Happiest New Year to the both of you, and the rest of your family. What a tender and touching anecdote. Thanks for sharing. Beth, Thanks so much for taking the time to read my piece. I will give her a big hug from you. Judy, I was very moved by what you wrote. I wish I had that time with my Mom. Once ill, she passed fairly quickly. And with Dad, well a daughter can only do so much. Both of them were sharp til the end and I was blessed to have the same old conversations we always had. 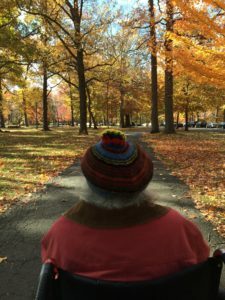 Now at 67, with cancer, my own mortality is staring back at me. Time is so precious. And when young we don’t get that until too late. I’m a bit of the family historian too. Rachel Ray? No wonder Jake is such a foodie! Lol. Donna thanks so much for taking the time to read my piece. I hope you are getting the care and love you need. Yes time is so precious.